A classic collection of paving stones, fire pits, walls and more; Newline Paving Stones offer a beautiful look with varying color, size and pattern options. The entire Newline collection is available from Marshall Stone. We stock and have on display the most popular pavers and colors. Lead-times for special orders are typically no more than 2 weeks. English Cobble provides a true classic look with an antiqued soft look and feel that gives this selection a timeless and sophisticated look. English Cobble is tumbled so the cobbles look like they have been weathered and in place for years. Please view the color options we have in stock below. If you are looking for a color we don’t have in stock, not to worry, we can special order any color or size of English Cobble. 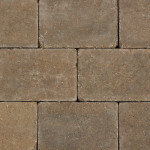 Available in 6 x 6 and 6 x 9, the Classic Cobble is easy to use and offers a lot of flexibility and options when designing. These cobbles provide an old world feel with soft, rounded corners and a domed top. Although the two sizes are sold separately, there are often used together in creating a unique design. If we don’t have the color you’re looking for, let us know. We can special order colors and quantities. If you’re looking for a more dramatic and larger apprearance thank typical pavers, York Tile may be a good solution for you. York Tile is a premier product from New Line and has a slate, vintage texture and long lasting strength. When ordered in pallets, each pallet has all three sizes of tile so you can mix and match for a beautiful, random pattern. We can special order any colors. Please note that these tiles are not recommended for vehicular use.